As the legend goes, when Parashurama – the warrior sage – threw his axe into the Arabian Sea, it retreated uncovering the land, which is now known as Kerala. This land reclaimed from the sea, is endowed with such scintillating beauty that even after centuries, it is known as ‘God’s Own Country’. While on Kerala tours, you will encounter endless gifts of nature in variety of colours and shapes. Picturesque landscapes created by the evergreen mountains, lush tea gardens, serene backwaters and golden beaches are the main appeals of this land. 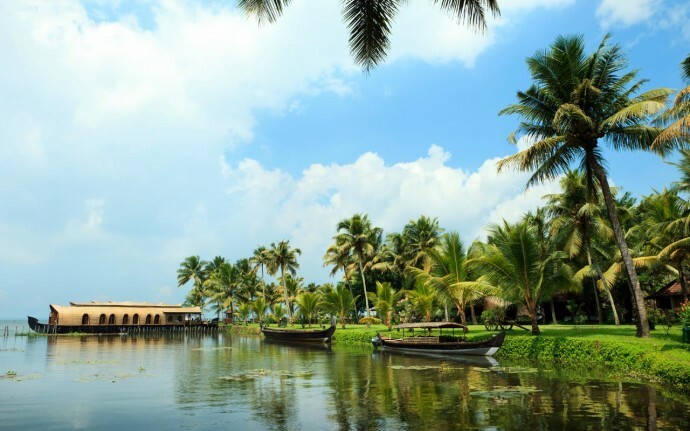 However, the unique charm of Kerala is not limited to its geographical features. Hidden in different parts of this state, there are many thriving art forms and traditional healing therapies that are essential parts of its rich heritage. Here are the three core aspects that will strike you during your holidays in this divine land. The incredible beauty of Kerala consists of many mesmerising landscapes that create amazing views along your journey through this state. Its long shoreline which forms a part of the Malabar Coast has many pristine beaches and scenic lagoons. Kovalam, Varkala, Chowara, Nattika, Chavakkad and Cherai are some of the most popular seafront destinations that you can head to during your trip here with Kerala holiday packages. These tranquil seashores are some of the best sites if you are looking for a spiritual experience in the lap of nature. When you move away from the coast, towards the eastern border of the state, you will notice a dramatic transformation in the surroundings. Palm-lined beaches and shimmering lagoons give way to rolling hills covered by green tea gardens and lofty mountains of the Western Ghats. You can head to the charming hill station of Munnar in eastern Kerala for a refreshing time away from the cacophony of the city. Kerala is the birthplace of numerous art forms, be it in the field of music, dance or theatre. Kathakali and Mohiniyattam are two popular dance-forms of this land that are sought after by international and local artists alike. Although both dances were performed in temple precincts, they are quite different in terms of their movements, costumes and the messages they convey. Powerful and vibrant, Kathakali is a way of storytelling through dance by combining bright facial make-up and dramatic costumes. On the other hand, Mohiniyattam is the elegant dance of the enchantress wearing a simple attire – the pure white and golden saree of the local women. During your holidays here, you must attend one of these performances, as they are simply amazing. Kalaripayattu performances are another stunning spectacle that should not be missed in your Kerala tour packages. It is one of the oldest martial art forms in the world, and has influenced many other dance and theatre arts in the country. Ayurveda is the science of life and longevity that sprouted thousands of years ago, from the majestic forests of India. Developed by sages, who combined the profound thoughts of philosophy and medicine, it is among the oldest healthcare systems in the world. This unique and ancient science has been well preserved in Kerala and continues to be an integral part of the lifestyle of the local population. As a result of this, you can spot numerous Ayurvedic spas and massage centres in almost every corner of this state. They offer a variety treatments and packages to suit your requirements and preferences. A visit to one of these massage centres will relax your muscles, soothe your mind and rejuvenate your soul, relieving you of all the stress from your fast-paced life. Why You Should Choose Safari-Style Wedding And Honeymoon?